Just a few days ago we showed some leaked images of a device claimed to be the upcoming LeEco Le 2. 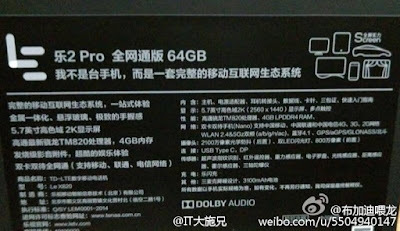 Now there has been a LeEco Le 2 Pro specs leak that shows 4GB of RAM. 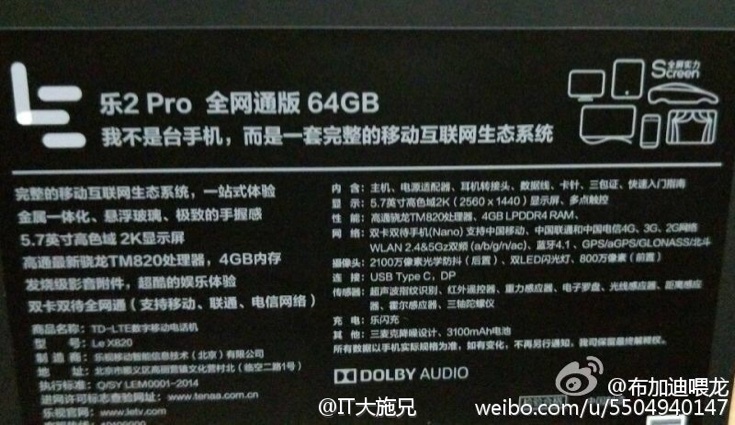 This suggests that the L2 2 Pro could be a competitor against the likes of the Xiaomi Mi 5 and others. Some readers may be more familiar with the Chinese manufacturer’s former name of Letv, but the company was recently re-named as LeEco. A recent arrival from this maker is the LeEco Le 1s, and some readers may also know about the LeEco Le Max. Until a few days ago we had not heard of the LeEco Le 2, and along with the leaked images we also shared some rumored specs for this handset. Now there has been a new leak out of China about the LeEco Le 2 Pro, and some of these leaked specs (but not all) are the same that were mentioned for the Le 2. The online leak cites LeEco Le 2 Pro as having a 5.7-inch display with Quad HD resolution (2560 x 1440), 4GB of RAM, and 16GB of internal storage. Further specs of the Le 2 Pro are said to be a 21-megapixel rear camera, an 8-megapixel shooter at the front, and a 3100 mAh battery. The rumor points to two variants of the phone, one with a Snapdragon 820 processor and the other with a MediaTek Helio X20 processor. The leak even includes respective pricing of CNY 1,699 and CNY 1,999 for these variants. As with all leaks we’ll stress that this should all be treated as unconfirmed at the moment, and we’ll be looking forward to the launches of the LeEco Le 2 and LeEco Le 2 Pro for the official specs and prices. We’ll certainly bring more news as we hear it, so do check back with us from time to time.